Yes, the caviar fish! 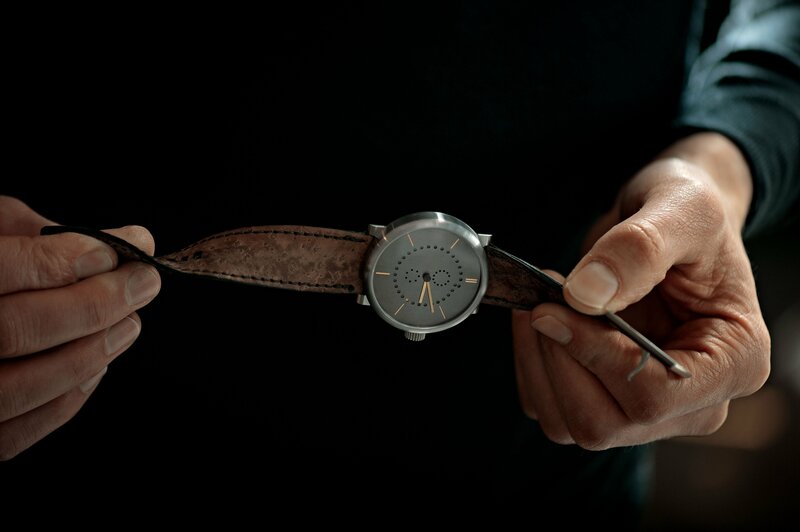 The skins for our sturgeon leather straps come from the Tropenhaus in Frutigen, Switzerland. ochs und junior’s sturgeon straps are naturally waterproof without any added chemicals or special treatments. They are perfect for playing sports (Beat Weinmann is putting his through an extremely intense trial), swimming, or taking in the shower. 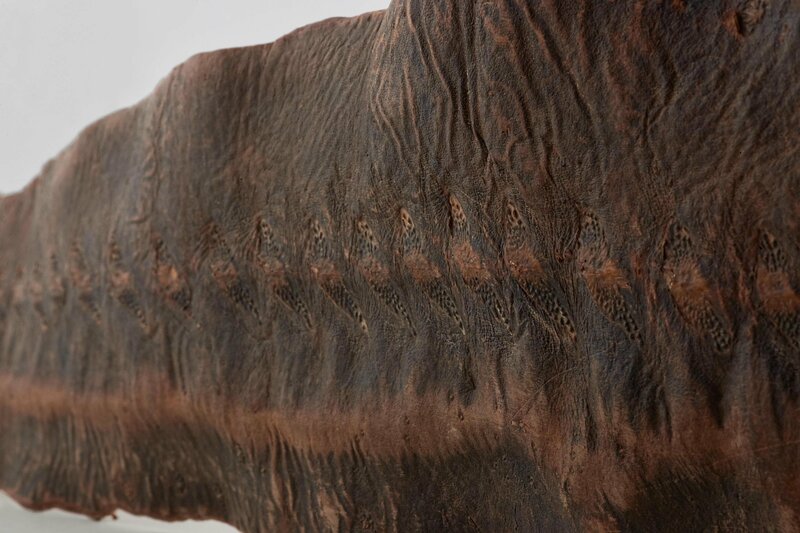 The sturgeon straps dry quickly and can be washed with soap and water. As a result, they do not develop a smell like cow leather straps. 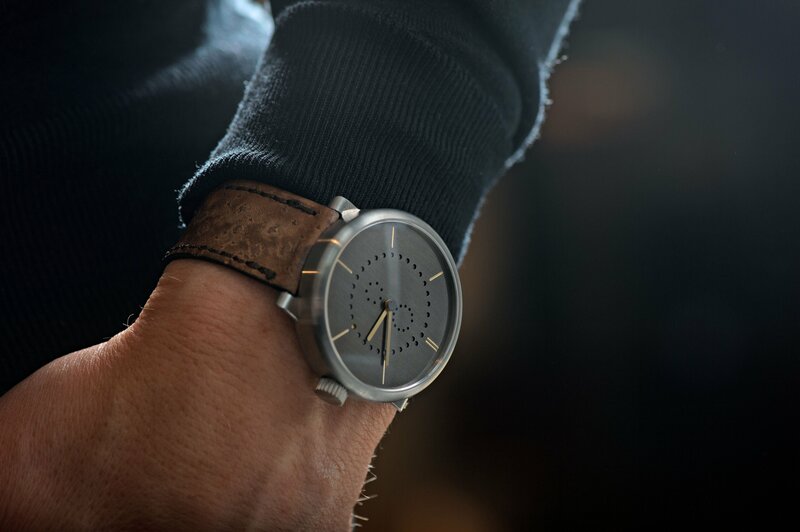 The sturgeon leather strap is the most robust and long-lasting natural leather strap we have ever used. Under the most intense possible use, we expect the straps to last 3 years (under normal use, a very long time). In 2013 an ambitious Lucerne University textile design student named Sabina Brägger visited our workshop with leather samples she had made from sturgeon fish raised at the Tropenhaus in Frutigen, Switzerland. Sabina had identified perhaps the only remaining inefficiency in this high-tech Swiss renewable energy project. The Tropenhaus uses warm mountain water from the Lötschberg tunnel to create an ideal environment for sturgeon fish. The fish form part of a hydroponic ecosystem that produces tropical fruits and vegetables year round. The onsite restaurant harvests the fish for their meat and caviar, but the skins were simply being discarded. Sabina wondered if something useful could be made out of them, and became aware of our a bit different watch company (Lucerne is a big Swiss city, but very small by international standards). 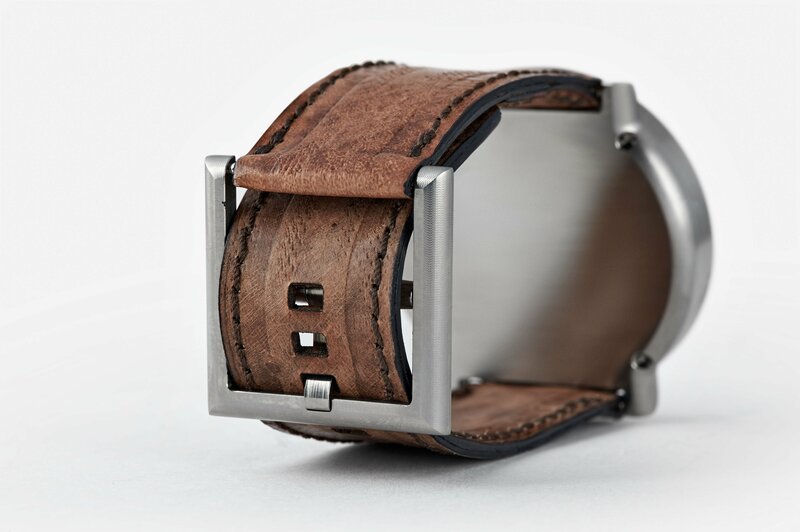 Together we developed the design for a sturgeon leather strap that is as functional as any we have ever used. You can read the story of how the sturgeon strap came to be (November 4th, 2013). The sturgeon skins are sourced from the Tropenhaus in Frutigen, Switzerland, and are vegetable-tanned in Switzerland by Zeller in Steffisburg. Sabina Brägger lasers the straps in her work atelier in Zurich and sews them in her leather atelier in Berne. The design is ochs und junior’s. CHF 250 (USD or EUR converted at the current exchange rate). The buckle is a special design by Ludwig Oechslin – it requires no loops! 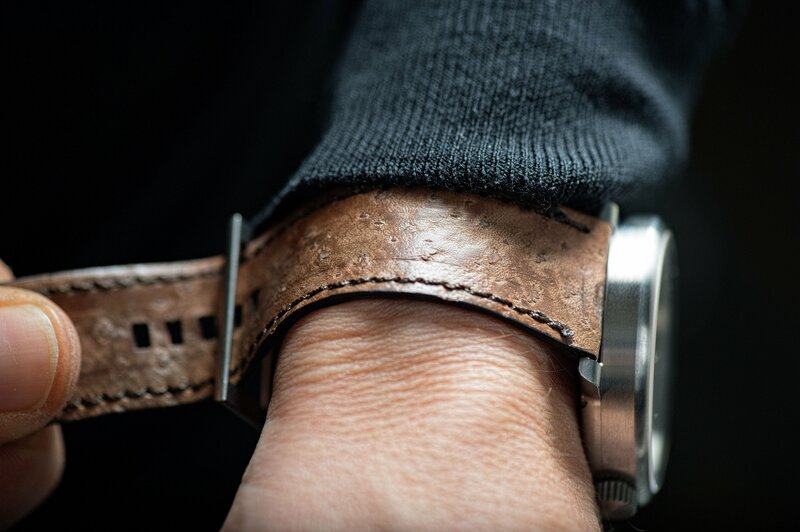 An extra wide opening enables you to tuck the tail of the strap inside against your wrist. The look is elegant and the fit is very comfortable. Manufactured by Peter Cantieni at his workshop in Hinwil, Switzerland, the buckle has visible machining marks which show the precision of Cantieni’s workmanship. 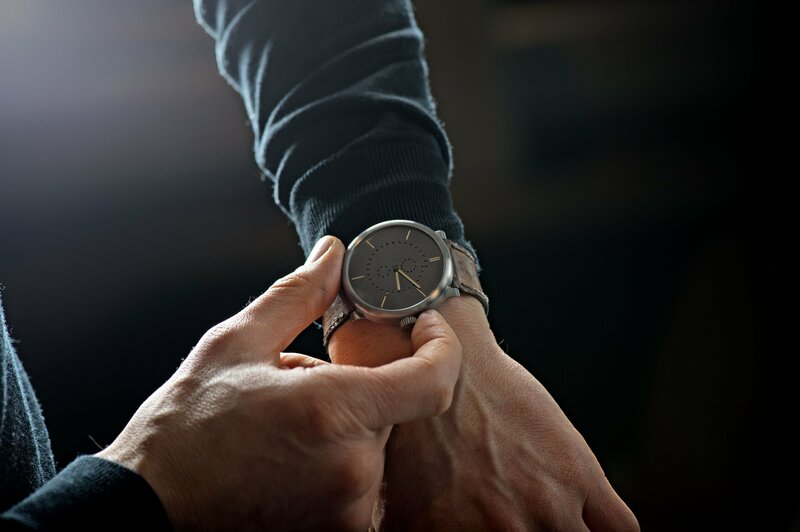 CHF 300 in grade 5 titanium, or CHF 400 in sterling silver 925. Please contact cofounder Beat Weinmann using the information below. He will send you a secure credit card payment link so that you can make the payment with any major credit card. We will need to know your wrist size to fulfill your order. You can measure your wrist using the method described here.